Money transfer has become almost instantaneous in India, with several banks doing this electronically. The money order of the state-owned IndiaPost, however, does things the old-fashioned way, although this could mean delays, even losses in transit. The department does provide an instant money order (iMO) facility that it launched last year, but this involved cloak-and-dagger stuff with the sender transmitting a secret code (by telephone or otherwise) to the receiver—the latter gets the money only after providing this code. In an effort to encourage more people to send money through money orders, the government will launch an electronic money order (eMO) on August 15. This will transfer up to Rs50,000 between select locations in minutes, and follow up with email and SMS (short messaging service) alerts. However, conventional money orders will continue to exist. The current limit on the amount of money that can be transferred through these is Rs5,000. Between 2004-05 and 2005-06, money order traffic declined from about 101 million to 96 million, while the amount of money transferred through this route barely increased, from Rs7,052 crore to Rs7,183 crore. Commissions on money orders rose 2.2%, from Rs326 crore to Rs334 crore. IndiaPost ended 2005-06 (the latest year for which such data is available) with an overall deficit of Rs1,200 crore. The service will transfer money over the Internet. A customer can walk up to any of the around 500 branches where the service is being launched, and set up an e-account. Once cash is deposited in this account, the post office will transmit a request to the receiver’s post office via the Internet, and the sum will be paid from the daily cash registers of that post office. The fully electronic money order will provide live updates on the status of money orders as they travel from sender to receiver, in a matter of seconds. The software to run the service is being written at the postal department’s laboratory in Mysore and state-owned telco Bharat Sanchar Nigam Ltd (BSNL) will be the department’s mobile-alert partner. No part of the transaction on eMO will need to be on paper, which is a major deviation from existing money orders, where a form has to be filled up and paper receipts have to be sent, signed and delivered back to the sender. Khan said that the all-electronic money order will be convenient and cut costs for the department of posts. A regular money order typically costs Re1 for every Rs20 transferred and 25 paise for a money order form that is filled out, but on those rates, IndiaPost has been losing Rs30 for every money order it sends. Most of the money goes in sending back signed receipts, which doubles the postal department’s job in money order transactions. Though the rates being considered for email alerts and SMS reminders are “very, very nominal", the commissions on actual cash transfers and paper receipts (for such customers that need these) will also cover the costs involved in sending money orders. 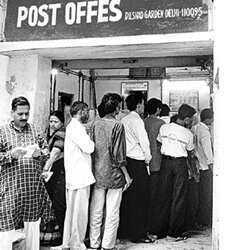 “We are a lot wiser now at IndiaPost with prices. Our losses have gone on for far too long. This needs to change. So we will set a minimum charge on money orders. For the eMO, the more money someone sends, the more lucrative we’ll try and make it for them," said Khan. The minimum charge being considered for an eMO of Rs1,000 is around Rs50. Unlike conventional money orders, eMOs cannot be lost or stolen.